Most Guitar players pick up their guitar for a practice session, and straight away start playing, then they just start playing songs they already know, put their guitar down and that’s it. If this sounds like you, I can help you, so read the rest of this article. You do not want any distractions while you are trying to practice, so get rid of anything that could distract you such as the radio, TV, phone, people (please do it nicely though) etc. No matter what you are playing, you need to be fully warmed up to have an ‘Effective Practice Session’. To do this, just start by shaking your hands around trying to create blood flow to the tips of your fingers, then do some left and right hand exercises on the guitar such as hammer on and pull off scale, alternating picking to a metronome or chromatic scales. Decide what you actually want to get out of the practice session, make it realistic to the time you have e.g. don’t say you want to write a full song if you only have 10 minutes. You may choose you want to learn a new song, write a new song, get better at a certain technique, learn a new technique, the possibilities are endless. In your head, quickly decide how you are going to reach the goal you set above. If you are writing a song this may be to find a riff, then a vocal melody, then some lyrics. If you are trying to learn a new song this may be to listen to the song, find a tab/sheet music, and learn the song. 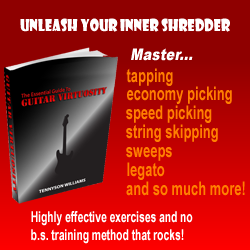 Don’t skip this as it is an important part of having an effective Guitar practice session. Start working your way through the mental plan you created above, all the way to the last step. Whatever you do, make sure that you end on a success. What I mean by that is if you were trying to learn a part of a song, make sure you play it perfectly before packing up, even if you play it at one fourth of the speed! This will make you more motivated for future practice sessions and will help you greatly. If you follow the steps above, and use them each and every time you pick up your guitar for practice, you will see a huge increase in what you are achieving during your practice sessions.